It's far too easy to allow the national media and disparaging fans to undermine Clevelanders' views of their professional sports teams. While the Browns, Indians, and Cavaliers have certainly caused more than their fair share of frustration and heartbreak over the past century, there are countless moments of glory in the fertile athletic history of Northeast Ohio that receive little notice east of Shaker Heights or west of Rocky River. Jonathan Knight's ""Classic Cleveland Series"" sets out to combat this trend, bundling together the most memorable moments of Cleveland's beloved atheltic clubs. In three separate publications, Knight ranks the fifty greatest games in each franchise with entertaining accounts of each contest, properly placing them in the broad landscape of civic history.Regardless of what the current editions of the Browns, Indians, and Cavs accomplish, every contest played is another chapter in an epos connecting each generation of fans to the ones before it. ""The Classic Cleveland Series"" colorfully illustrates that regardless of today's final score, the simple continuation of the saga is reason enough for reflection and celebration."" Classic Browns"" counts down the fifty greatest Cleveland Browns games, from unexpected upsets to incredible comebacks to titanic championship battles. The rich, six-decade history of the Browns is layered into these tales, tying together the gritty All-American Football Conference games played in the shadow of World War II to the sleek Sunday battles at shimmering Cleveland Browns Stadium today.Knight ranks heartbreakers like The Fumble and The Drive alongside championship duels and epic confrontations with heated rivals. 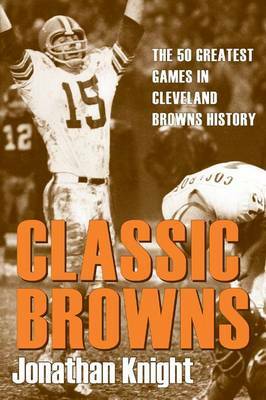 Included in these pages are the heroics of Browns legends like Otto Graham, Lou Groza, Jim Brown, Brian Sipe, and Bernie Kosar to name just a few. Whether it was because of the score, the weather, or an amazing individual performance, each game included in ""Classic Browns"" is worth remembering and revisiting. Sure to spark interest and debate, ""Classic Browns"" will appeal to Browns fans everywhere.